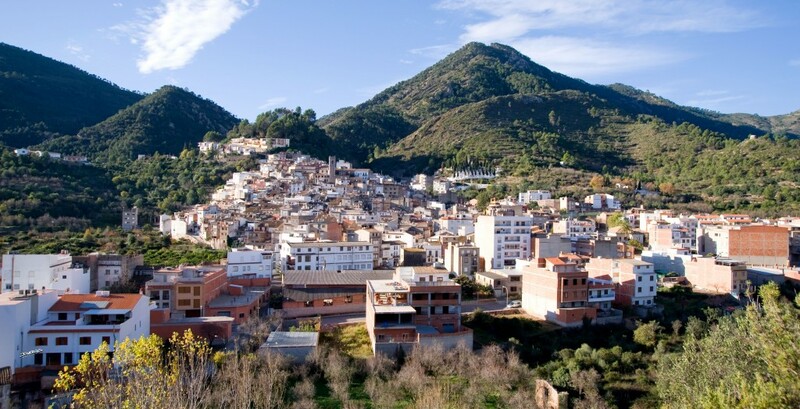 Located in the heart of the Sierra de Espadán Nature Reserve, 30 minutes from Castellón de la Plana and less than an hour from Valencia, capital of the autonomous community. The Sierra de Espadán offers a setting of lush forests of pine and cork oak, while the landscape also includes orchards, almond and olive trees. At the time of the Arab occupation Eslida reached its peak, improvements were made in agriculture, the town walls and the castle were extended, etc. Thereafter, there have been good times and some less so, but from 1950 Eslida regained its prosperity through cork as well as becoming increasingly geared to tourism, with a significant number of second homes. The town is blessed with being right in the Sierra de Espadán Nature Reserve, and has 5 mineral springs, one of them is the only source of drinking water in Valencia. Also, beautiful caves are dotted all over the area, interconnecting throughout the park. Of historical interest are the Aqueduct of the Rambla, the Air Mill, Els Corrals farmsteads and the Calvary Hermitage. Eslida is a leader in beekeeping and the production of local honey. Currently there are 8 beekeepers in the town and three of them sell locally. There are traditional festivals all year, but more going on in summer, when the population multiplies. As for the cuisine, try the tasty meats, stews and desserts. Poble stew, cabbage or Diju stew, los gazapos are young rabbits. Besides all this, an extensive network of paths for hiking, biking, horseriding provide for nature lovers. Contact the company Ocio Eslida Aventura for organised trips. Sources: Information extracted from www.eslida.es, http://parquesnaturales.gva.es and Wikipedia.